15 Things To Do In Solo for an Unforgettable Holiday! 15 Things to do in Solo. No. 10 is my Favourite! There are two old dynasties in Central Java, the Sultanate of Yogyakarta and the Sultanate of Solo (also known as Surakarta). Yogyakarta is like the famous older brother of Solo. Tourists visiting Indonesia quickly learn all about Yogyakarta, and its attractions and things to do. In the mad rush to explore Indonesia, Solo often gets overlooked. Part of the reason for this is that Solo is more famous for business than tourism. That’s a shame, because there are a lot of great things to do in Solo. Here is a list of some of the best things that you can do and see in and around Surakarta/Solo. I hope after reading the article you’ll agree that Solo is also a great holiday destination. Are you a big fan of batik cloth? Solo is famous for the quality of its batik. Klewer market is a traditional market where you can find a lot of different varieties and quality of batik. I remember my mom always included a visit to Klewer market in Solo on her itinerary every time we visited our grandma in Boyolali. You’re guaranteed to find some nice batik here if you look. Pasar Triwindu is the antique/flea market of Solo. The market is located in the city center and is heaven for people who are interested in antiques (Javanese daggers, leather puppets, decorations, etc). Of course you do have to be careful when shopping here. Just like Jalan Surabaya in Jakarta there are a lot of fake products sold here. Still, shopping in Pasar Triwindu is an enjoyable experience. Exploring Pasar Triwindu feels just like walking through a museum. The market is relatively tidy and clean. It is quite nice for window shopping, or just taking some photos and just enjoying an afternoon stroll if you are looking for things to do in Solo. 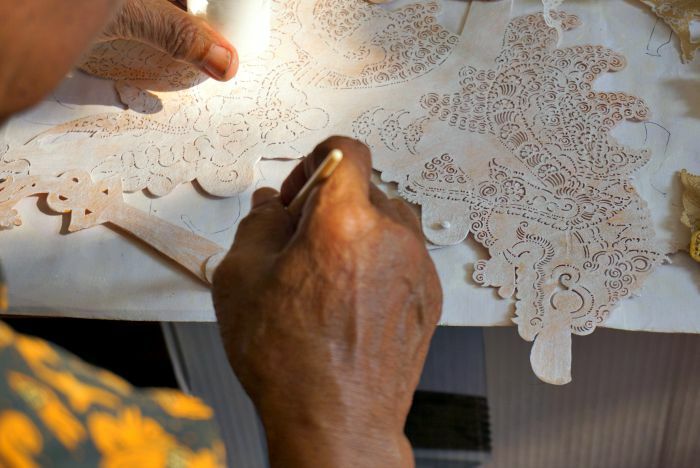 If you are in search of classic batik then you need to visit Laweyan Batik Village. This village is famous for its history – in the past a lot of wealthy batik businessmen lived here. Visiting Laweyan feels a tiny bit like you are stepping back into the past. You can walk through the small alleys, see old spots/buildings that are very attractive and also do a bit of boutique shopping. 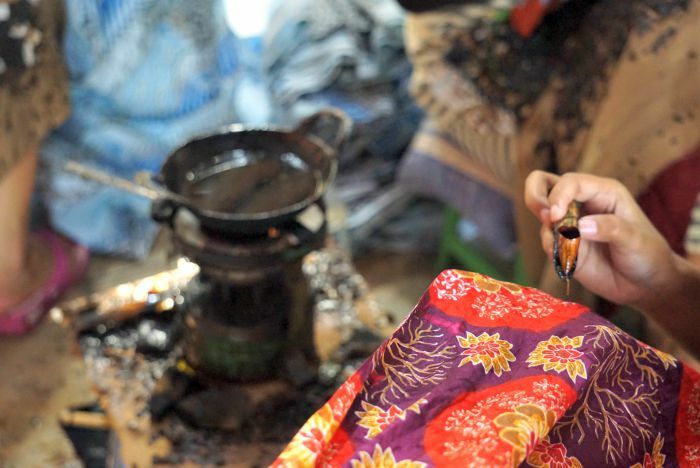 When you visit Laweyan you can learn how to make batik, see how batik is created and do some batik shopping. You can visit Mangkunegaran Palace (Pura Mangkunegaran) and Kasunanan Palace (Keraton Surakarta Hadiningrat). I didn’t have the chance to visit Mangkunegaran Palace, and only visited Kasunanan Palace. The Palace grounds cover a large area. It’s a nice place to visit and the environment is very relaxing. However, the museum is falling apart and in desperate need of renovation. The old mosque (Masjid Agung Kraton Surakarta) is one of the most famous landmarks in Solo. 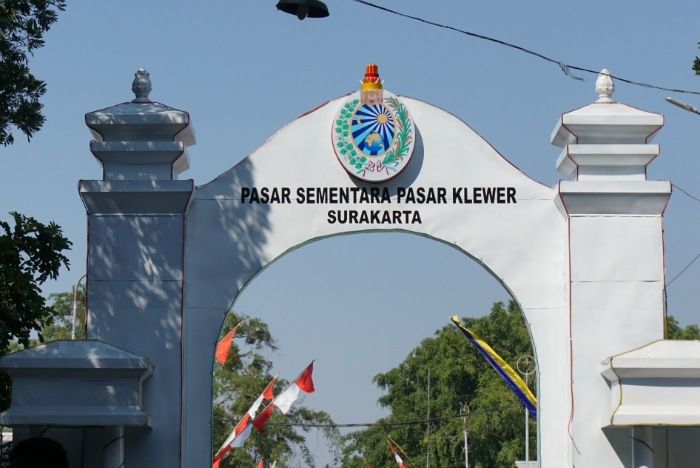 I remember visiting it often when I stopped by to see my relatives in Surakarta during my childhood. The mosque has a traditional Javanese design, and the interior is large, airy and spacious. 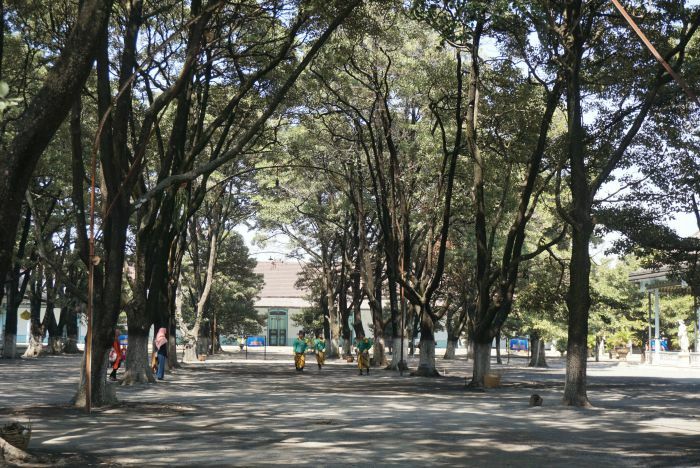 If you are driving along Slamet Riyadi road, you can’t miss the old railway of Sepur Kluthuk Jaladara. Locals usually call it the Jaladara steam train. It’s a traditional steam train from the colonial era and it’s painted black. You can still ride on the train. The journey starts from Purwosari station and cuts across the city of Surakarta ending at Sangkrah station. Early reservation is needed if you want to ride the train, which is already more than 100 years old. Cengklik reservoir is located in Boyolali. It is to the west of Adi Sumarmo airport of Solo. The reservoir is a perfect place for sunset lovers and people who love photography. You can take great photos of the reservoir at sunset with a view of Mount Merapi and Merbabu in the background. 8. Visit the White Buffaloes! When we were exploring the area around the palace I was introduced to white buffaloes, which are said to be descendants of the sacred buffalo – Kyai Slamet. It reminded me a bit of the special buffalo in Tana Toraja. Kyai Slamet and his descendants are considered special to the people who live in Surakarta and the surrounding communities. There is a local tradition that involves the buffaloes. 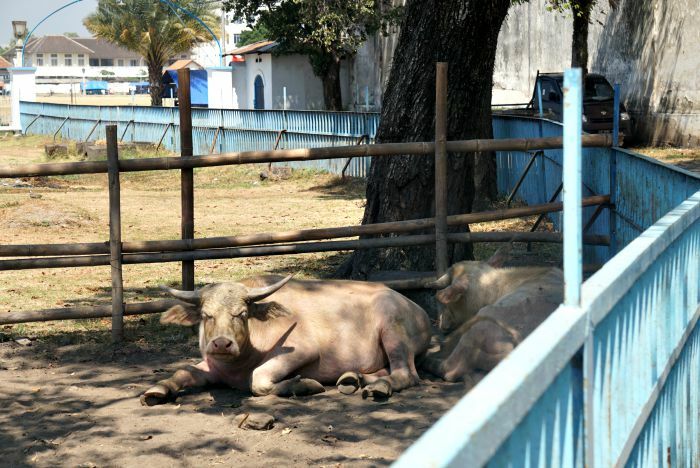 On the first of Suro (Javanese calendar), at midnight, a parade is held for the white buffaloes. Solo is famous for its food! Some of the highlights that you should try include the Nasi Liwet, Serabi Solo and Buntel satay. This type of food is easy to find around the city. A very touristy place to eat Nasi Liwet is at the Nasi Liwet Wongso Lemu – around Keprabon. Though it is busy with tourists, and locals say it’s a bit expensive, it is tasty! Nasi Liwet is steamed rice cooked in coconut milk and chicken broth and served with a bit of this and that. For example, you might find a slice of omelette, shredded chicken, a boiled egg (pindang version), tempe and vegetables. 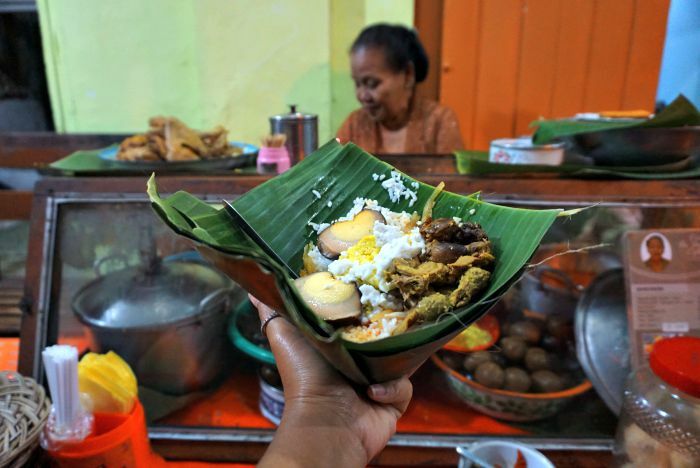 One traditional snack to try in Solo is Serabi Notosuman. This Indonesian pancake is made from rice flour with coconut milk. Sometimes it comes with shredded coconut and wrapped in coconut leaves. Serabi Notosuman is baked with charcoal. Toppings, like chocolate, can be added to the Serabi. 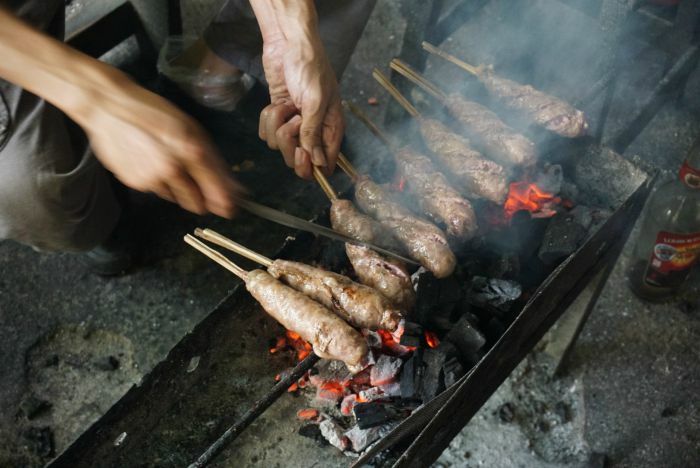 Another speciality of Solo is Sate (satay) Buntel, which is made from minced goat meat wrapped in goat fat. This is is served with soy sauce and slices of tomato, cabbage, red onion and chilli. 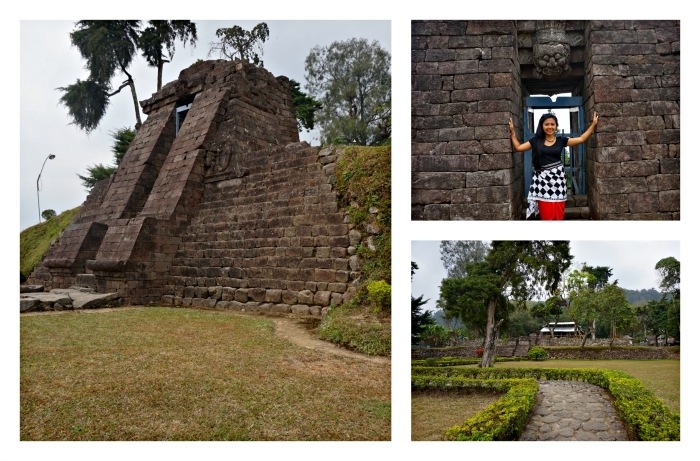 Sukuh and Cetho temple were my favourite places to visit around Solo. The temples are located at the foot of Mount Lawu, about 1000 meters above sea level. The temperature at this altitude is cool and the views are amazing. I’d really suggest visiting Cetho temple. Cetho Temple has the same traditional design as you see in the temples in Bali. If you decide to visit Karanganyar area for the Sukuh and Cetho temple you should also visit Jumog Waterfall and/or Sewu Waterfall (Grojogan Sewu Tawangmangu). The best time to visit these waterfalls is during the rainy season. Central Java is famous for its culture. The highlight of the annual calendar is the Solo Batik Fashion festival, which is held in October. Another highlight is the traditional Javanese ceremony Satu Suro, which also held in October. If you are interested in checking out some of the cultural events in the city then visit the official Central Java website or the Solo event website. Wayang Orang is a human puppet show. It’s a traditional type of act that combines a play with puppetry and masks. You can see a show at the Sriwedari building, Slamet Riyadi street no 275, Brigjen, Surakarta. This is a great place to go at night if you are interested in local culture. You can watch a performance every evening Monday – Saturday. There are more or less 60 performers in a show. If you are interested in learning more about this show, check out the Facebook page: Wayang Orang Sriwedari. Solo has several malls scattered around the city. There is the Solo Paragon, Hartono Mall and Solo Grand Mall to name few. These malls are popular with the locals and it’s a nice place to grab a coffee or just do some window shopping. It’s a good way to pass the time if you have run out of things to do in Solo. If you happen to be in the city on the weekend then visit the famous Saturday Night Market Ngarsopuro. The market is famous for its food. Locals also really like to hang out here. Besides the food, you can also find souvenirs, crafts and some clothing stalls at the market. When I was in Solo I visited the Javanese dagger, leather puppet, batik and mask workshops. The two workshops that impressed me the most were the Javanese dagger workshop and the leather puppet workshop. It was very interesting to see how these two things are made. My visit to various workshops in Solo was arranged by The Royal Surakarta Heritage. They carefully crafted and chose the most interesting workshops to visit in the city. What do you think? Are there any things to do in Surakarta/Solo that I missed? I am sure there are, right? Let me know what you’d recommend in the comments below. Yes! A lot of good friends in Solo said that the Saturday night market is a must 🙂 oh yeah, also the food.. All yummy! whoa, this post make me miss my hometown so much !! I was doing 2 of 15 things, it means that I have to go back to Solo. Yayyy! Let’s go back to Solo. Explore more (and eat more?). Hahaha.. Thanks for stopping by, Akbar! Mungkin tahun depan main lagi ke Solo. 🙂 Kamu di mananya di Solonya? Apa yang sedang seru di Solo? Hi there! I’m Half Malaysian / Half Solo-ian but resides in Malaysia. I’ve been and tried all the items you stated above except Sate Buntel! Going back there end of this week to visit my relatives and will definitely try it out! I will definitely try every places on this post. Thank you for your recommendation. Appreciate it! You’re going to have a busy few days in Solo then 😉 Hope you enjoy yourself. Maybe can try Klewer Market. I’m in Solo right now, do you think I can book tours to the workshops if I’m not staying at Royal Surakarta Heritage? Hi Elan. 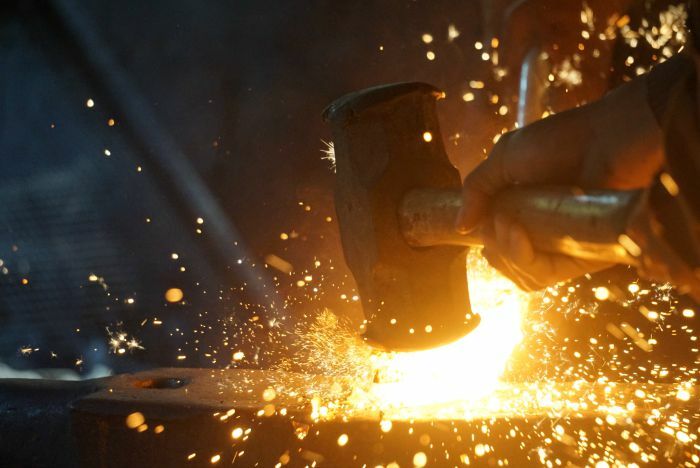 It should be possible to arrange workshops but I don’t have any contact information I’m afraid. Yes it is me! Gimana kabarnya? Wah senangnya blog aku dimampirin sama kawan lama. Belum tahu nih, mungkin Agustus atau September, tapi rencananya hanya ke Yogya aja. Siapa ada di Solo. Mau visit Solo tanggal 29 Mac ni. Hi! Thanks for the article, very helpful. If you don’t mind, can you share your itinerary at that time when you visited Solo? I want to visit Solo and I’m inspired with your destination list. However, I don’t know in one day how many places I can visit.. If you can share your itinerary at that time, it will be so much help for me. I spent 3 days in Solo. I explore places in the city center on day 1, I went to visit several workshops on day 2 and I went to the Sukuh and Cetho Temple on day 3. Royal Surakarta Heritage Hotel is the one who arranges it. Hope you have a great time in Solo. Hi Frista thanks for the tips .. i am planning to visits solo in Feb this year but time is so tight I only can manage to stay for two days your advice is much appreciated and thanks in advance. Dear Maman, if you have two days in Solo should do a day trip to Cetho and Sukuh Temple and another day to explore the city (Laweyan Batik Village), try local culinary and also visit the markets (Batik market and antique market). Have a great time in Indonesia. I’m in Solo right now, what a wonderful place. I’m a performer in the International Gamelan Festival, which features dozens of shows in several venues over a week. Hopefully this event will happen again, but I don’t know about that. Every Sunday morning, there is “Car Free Day” in which a major road is closed. Thousands of people come out to walk, bike, eat, shop, play music, exercise, parade with their dance and cultural troupes, and more. It was a fantastic event as a visitor. Particulars: “As often reported by TribunSolo.com, Solo CFDs are held every Sunday on Jl Slamet Riyadi Solo. Starting from the Purwosari roundabout to the Gladag roundabout, at 06.00 WIB to 09.00 WIB.” From an article I found and translated online. That sounds great! I would love to see the Gamelan Festival one day! Hope you are having a great time in Indonesia. Hi. Just arrived at Solo today. Going to treasure Solo tomorrow. Any suggestions for batik attractions other than Danar Hadi? I’m sorry for the late reply. Was off during the end of the year to spend some quality time with my family. Hope you managed to find something else than Danar Hadi. Happy New Year!